It's no secret, for small businesses, a Facebook, Yelp, and Twitter account are a must. A personalized mobile app is a great way to take customer interaction to the next level, but many business owners shy away because of steep development costs. Keep the checkbook closed, *for less than the price of a newspaper ad*, you can now create your own mobile app. 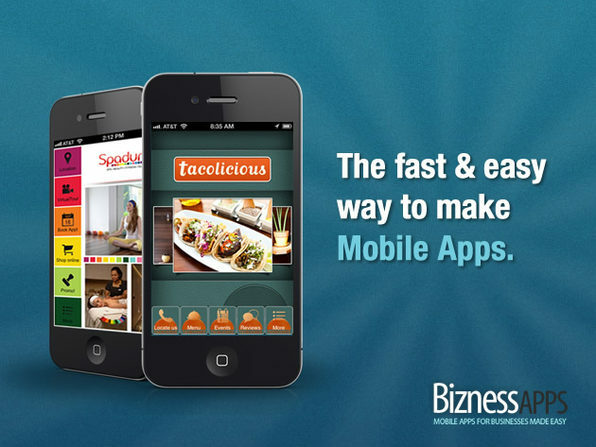 Bizness Apps is already helps *OVER 100,000* of small business owners grow their client base. As *the number 1 mobile app platform worldwide*, this truly is one of the fastest and easiest ways to make your own mobile app - with *zero* programming knowledge required. *Cloud hosted servers with the latest scalable and reliable hosting technology* - expect 99.9% uptime for your mobile apps. *Never lose your data* - Bizness Apps' data centers use state-of-the-art data encryption technology and perform daily, weekly, and monthly data backups. *No programming knowledge required* - easy to use content management system makes app-building a breeze. You will need to provide your credit card details at the time of registration for renewal purposes. You may cancel your subscription at any time to avoid further charges.